Hey guys hows it going! Jose here back with another video game review! First off I am going to go ahead and just say it, I did not know this game existed. I opened up steam and I received a gift from our founder Chris. The game was called Ubermosh. I looked at the game for a bit before I accepted the gift and I thought to myself, “Hmm what is this?” Lets put it this way, I am very very happy that I hit accept. Ubermosh came out February 17, 2016. The game was created and published by Walter Machado. He was able to bring Ubermosh to life by creating it in Game Maker Studio. So you may be asking yourself what is Ubermosh? Well Ubermosh is an arcade shooter that has you cutting bullets with a sword and of course shooting. The theme of the game to me feels and looks like a cyberpunk era. The graphics are simple it looks like your regular 8 bit or 16 bit game and plays very well. The premise of the game is pretty simple all you have to do is survive rounds and you get limited amount of lives and or hits you can take. Now, when it comes to the actual game play aspect, its simple. All you really do is use the WASD keys to move around and use your mouse to aim. You can move up, down, left, right, and diagonally. Enemies spawn in randomly and your main focus is to avoid getting hit and shooing back at the enemies. You left click on the mouse to shoot, and you right click on the mouse to cut the bullets. Now they don’t look like an actual bullet, its more of like blue blobs coming across the screen. There really isn’t an objective to this game. There is no princess, there are no power ups, and quite frankly that is what I like. Ubermosh is a very simple endless survivor game. Yes there are time limits when you play, and the longer you survive, the higher of a score you get. I know it sounds very easy to do, but trust me when I say that its very hard because than your screen starts to fill up with blue blobs and you’re right clicking the hell our of your mouse trying to cut those bullets. This game is going to leave you sweating, but the epic soundtrack is going to keep you pumped and coming back for more. Well this game is fantastic and its simple. That’s what makes this game so good. What I enjoy is the replay-ability that this game has and how it challenges you to stay alive. I personally enjoyed the graphics. Like I said in my previous paragraph, its a 8/16 bit style game and to me it had that nostalgia feeling. When I was playing Ubermosh, I was just reminiscing about how I would play galaga, or how I would be playing Mario on the Super Nintendo. I have to hand it to Walter, he made me go back to my childhood, even though this game isn’t a kid game. Now it’s kind of hard to say bad things about this game even when I already said all the good, but all games have their faults no matter how big or small they may be. The one thing that I don’t like is that all the enemies are exactly the same. The levels are the same as well, but just different color. So I guess what you can take away from this that the game is the same and there really is no change in the level design. Ubermosh in my personal opinion is a fantastic game. It is very addicting and I really do believe that this game should have a lot more attention than it has now. Ubermosh is available on steam and I suggest you guys go download it and comment your high score at the bottom. 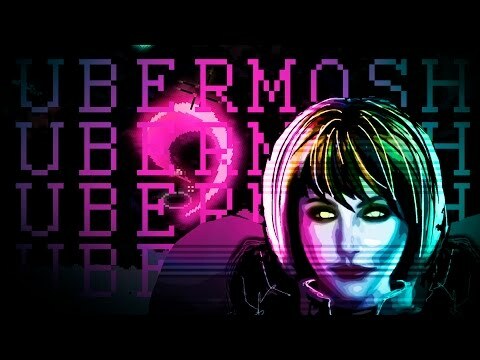 Before I end this review I want to say congratulations to Walter Machado on creating Ubermosh, and a happy 1 year anniversary to such an amazing game. If you enjoyed this review please feel free to leave a comment at the bottom and also leave a comment of your high score and the one with the highest score will win something. Either an Xbox live membership, Playstation Plus, or a Steam card. Have a great day guys.